The expansion will include a new partnership with Ubisoft, allowing players access to a large library of games already hosted on the Uplay client. NVIDIA's integration with the Steam client (well utilized for local setups on the GameStream system) was hinted at as well. Users will be able to log into Steam through GeForce Now, though it's not clear how much of Steam's massive cross-publisher library will be available on the streaming service. Online multiplayer games including Paragon and Marvel Heroes will be supported, and GeForce Now will continue to be available on SHIELD hardware as well. It's all powered by a new system of Pascal-equipped remote GPU servers built and maintained by NVIDIA at data centers across the country. Now for the kicker. 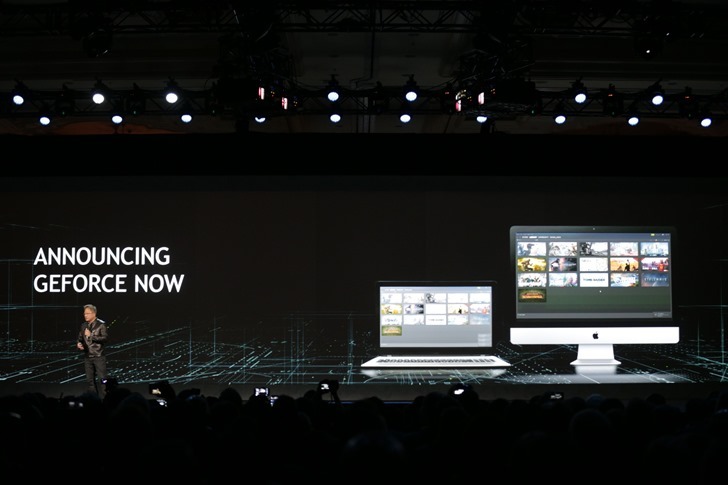 During the keynote, NVIDIA CEO Jen Hsun Huang said that GeForce Now will have a new pricing structure: $25 for 20 hours of play. That's a huge departure from the current system, wherein gamers can pay $7.99 a month for access to an established library of older games, plus dedicated purchases for newer titles. The new system will also have more expensive tiers for more graphically intense options, and of course all of it will depend on a rather robust home Internet connection. GeForce Now will still be somewhat limited versus a standard gaming PC, since NVIDIA needs to secure games for its library via licensing - titles from major publishers like Blizzard/Activision and EA were noticeably absent from the presentation. At the moment GeForce Now is something of a Netflix-style all-you-can-eat subscription, except for the premium titles. How well will gamers respond to a hard limit of 20 hours for $25... especially since dedicated gamers might spend 100 hours a month or more in their favorite titles? Will current SHIELD owners who subscribe to GeForce Now be able to keep their relatively cheap subscription? We should find out in March, when the updated system is scheduled to launch.